I’m kind of a chronic over-purchaser of certain items, and the item varies from week to week. This week, I overbought limes. Every time I went to the grocery store (which is often) I bought 8 to 12 more limes. I guess in my mind, a home without limes is just not the place to be! So, in an effort to utilize all these limes, I decided to make mojitos! Earlier this week, I had some friends over and made a pitcher of traditional mojitos. They were good, but they just weren’t minty enough in my opinion. So, I changed it up a bit and made this one with mint-infused simple syrup, and that seemed to correct that missing element. I also added some frozen blueberries, because I had them on hand and it’s always great to be able to make a cocktail with ingredients at your fingertips! Plus, it keeps me out of the grocery store, where I might buy more limes. As an added bonus, the frozen blueberries help keep the drink cold! To make mint infused simple syrup, combine one cup of sugar with one cup of water in a small saucepan. Heat until the sugar completely dissolves and the mixture becomes clear. Remove from the heat, add a few sprigs of fresh mint and cover the saucepan. After it completely cools, remove the mint leaves and pour into a storage container and refrigerate. 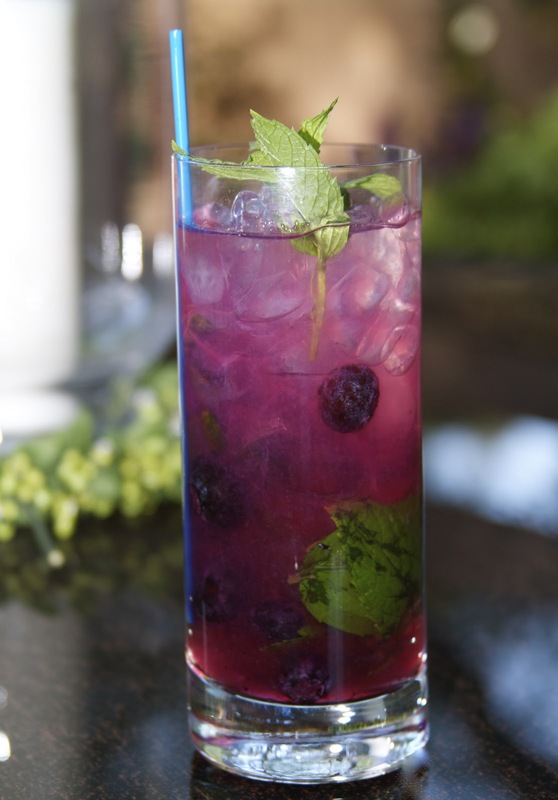 Muddle the mint leaves, simple syrup and half of the blueberries (about 6 blueberries) in the bottom of a cocktail glass. Add light rum, the remainder of the blueberries and fill the glass 3/4 with ice. Stir, then add sparkling water to fill the glass. Enjoy! Depending on your preference, you may want to add more simple syrup. For mine, I added about 3/4 ounce of the simple syrup.